The Pursuit Cup originated from a trophy awarded to Past club president, John Farnworth on his retirement. This individual Stableford competition is played in teams from the BOGs & BLOGs Saturday morning members groups. There is a time limit of 3 ½ hours at which point everyone must stop playing and total up their individual scores. There are prizes for top individual mens and ladies and the top teams. The pursuit cup trophy is awarded to the top scoring individual. 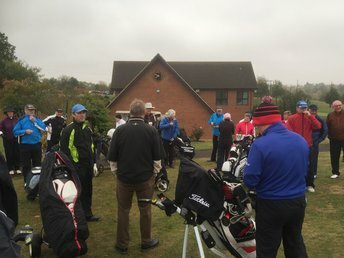 A very chilly morning and an early start did not put anyone off from joining in this annual event. BOGS captain John Farnworth explained the rules and regulations and carried out the random team draw....and then they were off ! The pressure of playing as many holes in 3 ½ hours showed in some of the early holes as teams tried to get ahead of the clock by rushing their shots. 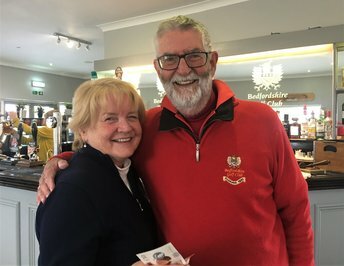 As teams progressed around the course rumours started spreading of a sensational hole in one on the 9th ! Was this really true given the cold wintery conditions. 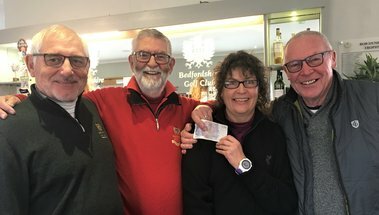 As the team completed their rounds everyone gathered in the clubhouse comparing how many holes were completed in the alloted time and enjoying a well deserved soup and roll. 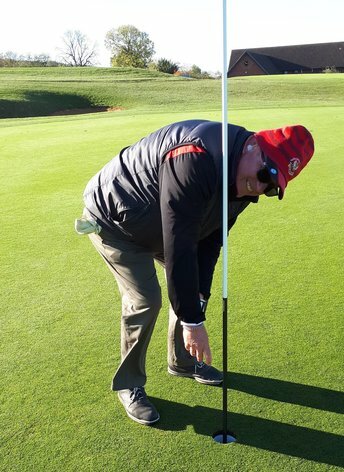 Rumours were also confirmed as it emerged that Robbie Brown had indeed scored a hole in 1 on the 9th ! Wet, Wet, Wet were the conditions on Saturday 6th October for the Annual BOGS versus BLOGS match. The BOGS took on a BLOGS team of 18 Ladies for the coveted ceramic replica toilet trophy - narrowly won last year by the BOGS. Despite the conditions, that progressively got worse as the morning went on, it was a good turn out on both sides. The format of better ball match play and with the ladies getting a generous additional 6 shots made for a tough challenge for the BOGS. 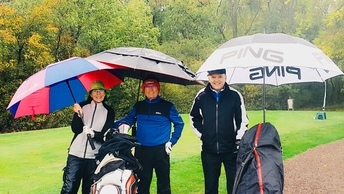 As the conditions got worse, many of the fourballs came in after 13 holes and only a hardy few played out the full 18. 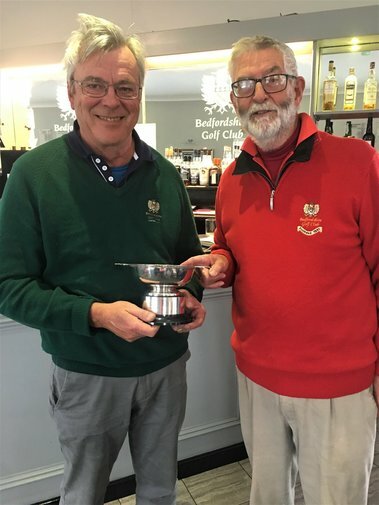 In the end, the conditions, the additional 6 shots the BLOGS received and any other excuse the BOGS could find all proved a bit too much and the BOGS team ended up overall losers at 11 holes to 24. 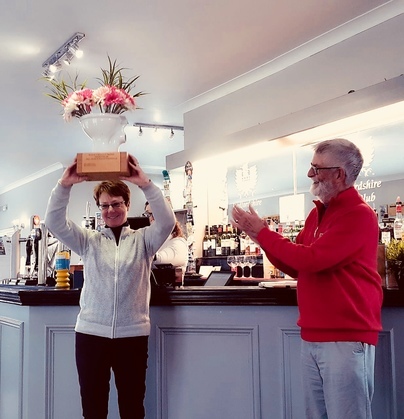 After drying out and a very welcome Soup lunch, the result was announced and the BLOGS captain Judi Monico received the coveted trophy from BOGS captain John Farnworth. How much the additional bonus shots given to the BLOGS made a difference and how many this should be next year will be debated for some time to come. 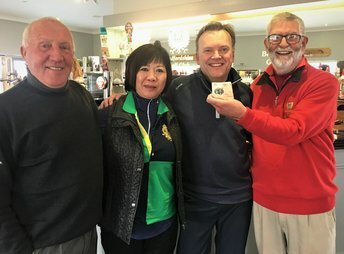 In what is now the competition's 7th year, the three big Saturday men's social golf groups, battled it out in the BOGS vs. BYGEMYST & Late Arrivals Team Challenge. Best individual performance of the day was by Seb Lovell who, playing off scratch, went round in 3 under for a Gross 67. Sadly for Seb, he and his partner still finished 6 down to inspired opposition who dovetailed remarkably well to secure victory! Both teams performed admirably, but the overall result saw the combined BYGEMYST & Late Arrivals team secure a notable victory and ensure 12 months bragging rights. 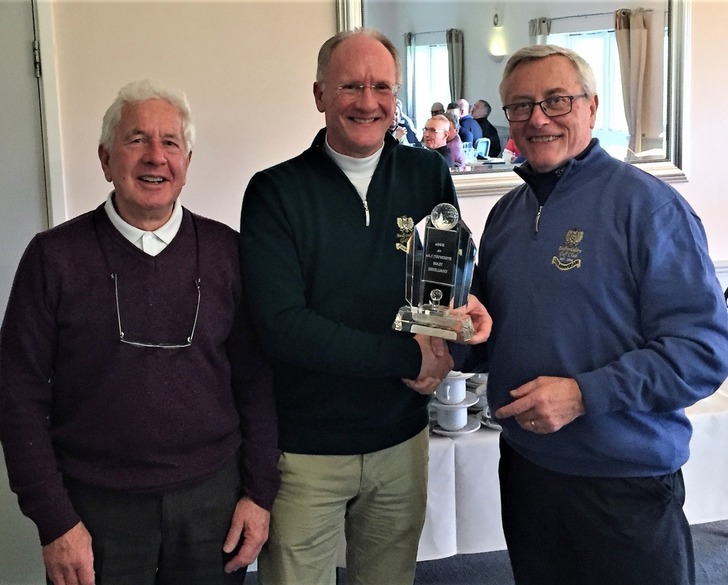 Following an excellent carvery lunch in the Biddenham Suite, BOGS Captain for the Day, Joe Nellis (in the absence of John Farnworth) presented the trophy to joint winning Captains Clive Haywood & Geoff Gooding (see photo).